We are counted amongst as the foremost trader and supplier of excellent quality Phase Sequence Indicator. This indicator is used to determine the phase sequence (A-B-C or C-B-A) of three-phase voltages. Our offered indicator is designed using premium quality material and modular techniques, in compliance with set industrial standard. Provided indicator is checked on numerous parameters of quality in order to ensure its flawlessness. When connecting any 3 phase equipment to the 3 phase power, the first step is to check the phase sequence of the 3 phase power supply. 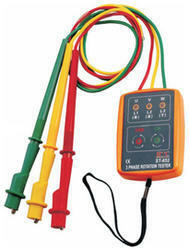 This instrument is a handy and essential instrument for checking the phase sequence in 3 phase Circuits. When connecting motors, energy meters, watt meters, Power factor meters, Power factor controllers, Power meters etc, it is very important to connect the equipments in proper phase sequence, otherwise the instrument / equipment can be damaged or give incorrect readings.The instrument can also be used to check for open phase( one phase only). 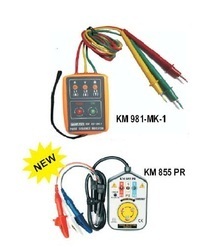 Model - KM 855 PR- Test leads with Insulated Crocodile clips, Instruction manual & carrying case. 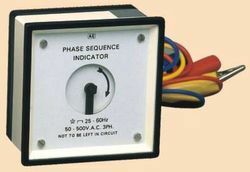 Looking for Phase Sequence Indicator ?